Anthony is an associate in the firm’s Commercial Real Estate Group. He has extensive experience with all phases of commercial and residential real estate transactions, banking practice, and title. 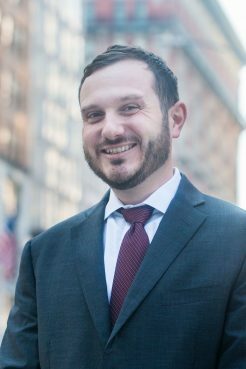 Prior to joining MMPS, Anthony worked with a commercial real estate firm where he represented large real estate developers on financing, acquisitions and dispositions of properties throughout the five boroughs. Most recently Anthony relocated to Northern Virginia for a short time and worked as Managing Attorney of a local title company where he became a licensed title agent in Virginia, Maryland and Washington, DC. However, he has since returned to MMPS rejoining the firm’s New York City office and focusing his practice on commercial lending and condominium offering plans.